This one got lost among some other stuff I had saved but now is as good of a time as ever to throw it up. My Cubs came oh so close to hosting the Wild Card Play-In game but they finished one game behind the Pirates in the final standings which means the game will be played in Pittsburgh. Two teams with very loyal fanbases, one (Cubs) with the third best record in all of baseball and the other (Pirates) with the second best. One of these cities will suffer from a huge letdown come Thursday morning. An undoing of the three best teams in MLB all coming from the same division in the National League Central. All I know is whatever happens that both teams should be right back in the mix next year. Specifically the Cubs who should they lose might cause for the want of comfort which could result in the eating of a hot dog or an Italian beef or something like a pizza puff in order to feel better. If the Pirates lose I imagine some of their fans will be eating on Stuffed Banana Peppers, Pierogies, and Fried Fish Sandwiches. Some of the regional eat highlights from a trip I took with jimswside this past August. As always we hit up the classics and mixed in some lesser knowns. The hot dog portion of this endeavor can be seen HERE and you can find more from Pittsburgh HERE. I look forward to one day returning to town for a baseball and more urban exploration. It was a hot weekend but we made the most of it. 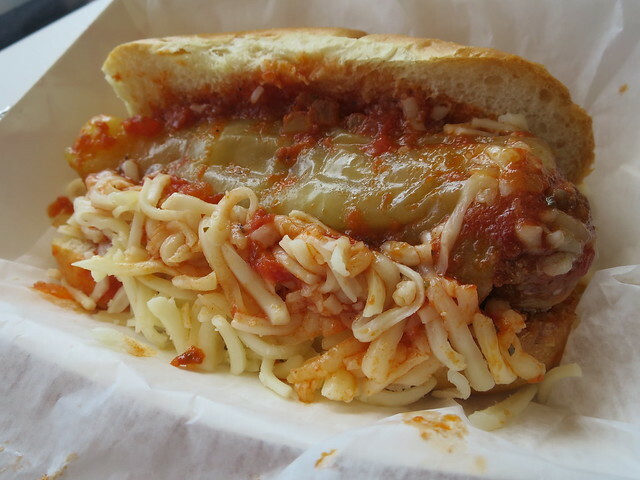 Pittsburgh has lots of old school red sauce Italian type places and as I perused through some of their menus it became apparent that both Hot Italian Sausage sandwiches are popular around town as are banana peppers stuffed with hot sausage. This spot on the outskirts of town was hidden in a strip mall, some of the best spots are these days. We stepped in and were greeted with warm smiles and a very grateful welcome by the owners. 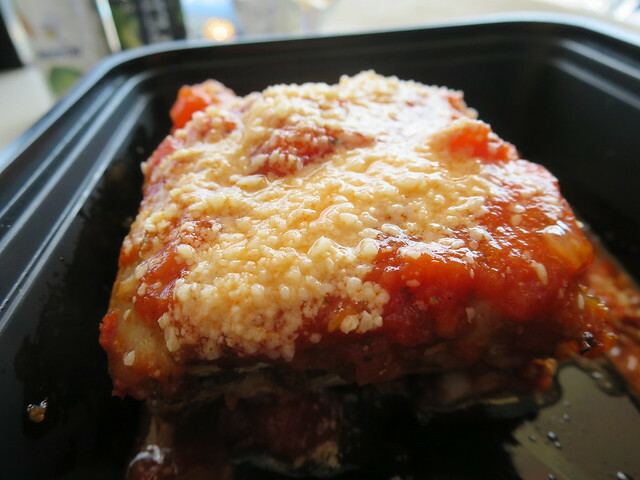 I couldn't help but order a piece of the days special lasagna, it looked perfect sitting in there. An excellent rendition indeed. This little Italian style deli fit the description of so many others of it's type across the country. Display case of the days freshly prepared food was in front, fresh made sausage was also on display as were newspaper articles and family pictures on the wall. We were here to try their stuffed banana pepper which I mentioned is a popular eat in these parts. I asked the friendly owner how he stuffed the peppers and he told me they use the sausage machine. He got a tube that fits perfectly into a pepper and they fill them up using the machine. Brilliant. What it does is it keeps the texture of the sausage intact. Which I should add was a very good well seasoned recipe. I love the combo of banana peppers and sausage so this was one of my my favorite bites in town. You can get them as is or in sandwich for m where they put it in bread and top with sauce. Cheese is optional. I knew there would be pierogi in Pittsburgh it was just a matter of where. I had quite a few places on my list and Cop Out won out. 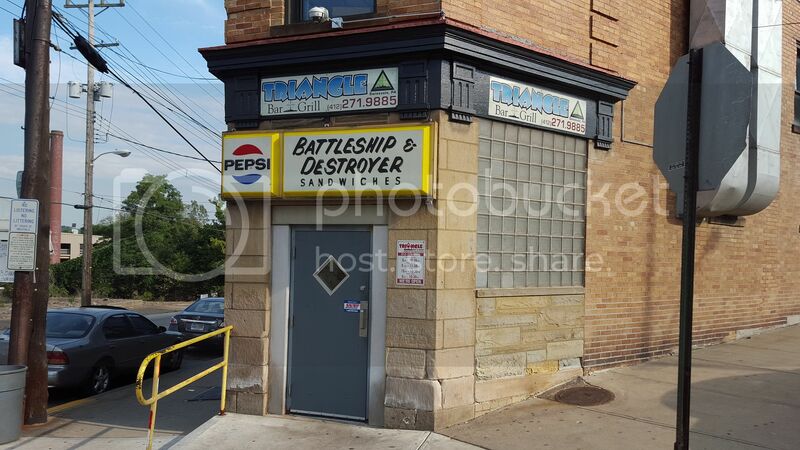 This place is a weekend only operation ran by a former Pittsburgh cop and his family. We stopped in and I decided to go with an order of the farmers cheese with onion despite there being a crazy amount of lesser seen options ala cheesesteak and Reuben etc. By choosing a traditional filling I was gifted with the best pierogi I can remember consuming. 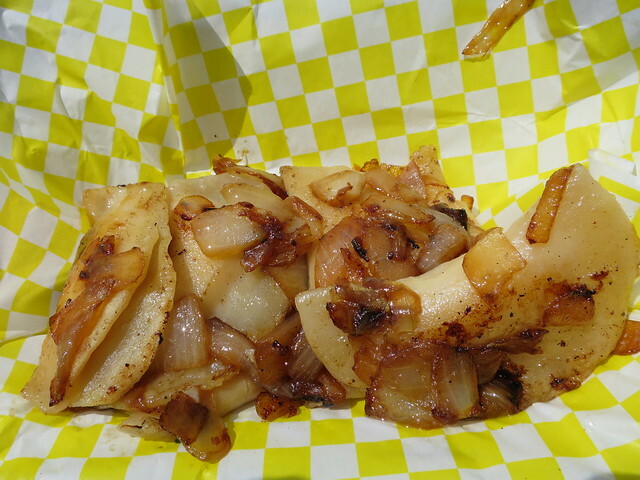 The skin was so soft yet stable enough to hold the hot flavorful insides while the onion thrown on top was as good of a batch of fried onion as I've ever had the pleasure of ruining my breath with. Pittsburgh knows Pierogi. Acting out on a tip from a buddy at the gym we decided to take a little Friday late afternoon drive for a Western Pennsylvania favorite. 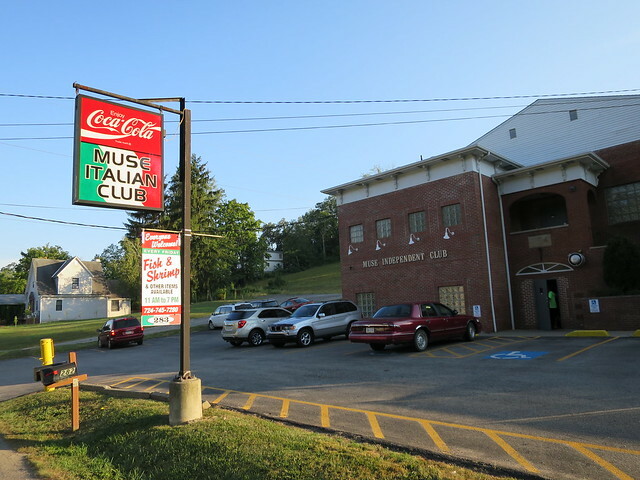 Each Friday this social club in the town of Cecil hosts a fish fry. 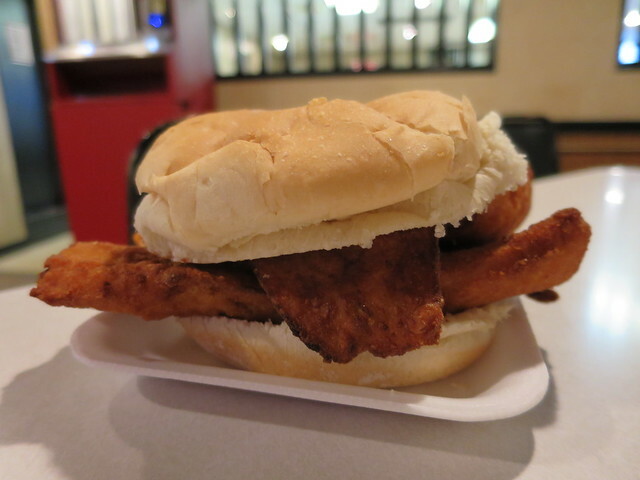 Fish Sandwiches are a favorite in these parts. It's somewhat odd since there is no ocean near but like many of the other stops along the Ohio River they have a strong tradition of eating fish sandwiches on Friday's. Busiest during lent but on the menu once a week thus popular year-round these are supposed to be one of the best fish sandwiches in the area. From an article on the wall - "The women of the club have been serving the sandwiches for decades, getting paid in tips. Four or five of them get together each Thursday to prepare roughly 400 pounds of fillets, 600 pounds during Lent. In a process that takes as long as five hours, the women hand wash each piece of fish and pick out the bones. They take pride that the fillets are "clean." The menu also sported spaghetti and tripe but it was a Friday and we were there for the fish sandwich which would end up being pretty good. Maybe not the most remarkable fish sandwich one can have but certainly a good bar bite. I felt like I was somewhere in the Midwest. One day places like this one will be memories. What's a trip to Pittsburgh without a stop into here? I had to do it and I had to go to the original one. We hit up the Strip District for lunch on the day we were leaving. After a respectable albeit boring fish sandwich at Wholey's we got to here right before the crowds in town to watch US woman's soccer team swarmed the place. Primanti Brothers got its start in 1933 and is now the symbol for food in Pittsburgh. You can get them at the Steelers games and Pirates games and I'm sure they're at the airport too. They take two thick pieces of Italian bread and stuff their Italian dressing based cole slaw into it with slice of tomato and fresh fries and your choice of meat. I tried the pastrami but think I should've gone mortadella to reach peak flavortown. I liked this more than maybe I should have since it was early afternoon and I had only had a beer. You can bet it's best enjoyed after a night out in the District. They stay open late for revelers of the night. Hopefully there wont be too many come late Wednesday. Go Cubs. About 6-8 weeks ago, we were in Pittsburgh recently celebrating our friends' wedding. The culinary highlight of our weekend was two visits to Gaucho, a popular Argentinian restaurant near downtown. We didn't love the empanadas, but everything else was excellent. Get the Rosemary Braised Beef sandwich, or a small (not small) portion of beef and a salad. The charred bread on the side is a revelation. Pgh is my home away from home (I'm an adjunct prof at Pitt), so I know it well. 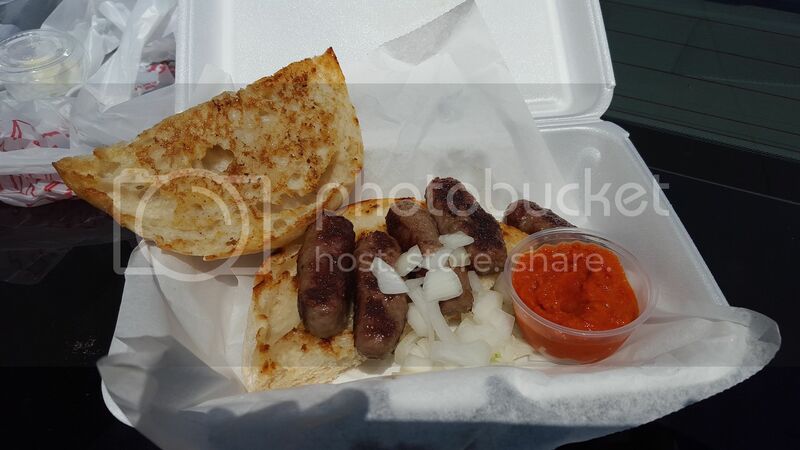 Next time you're there, be sure to have a cooler with you so you can go to Parma Sausage down in the Strip. 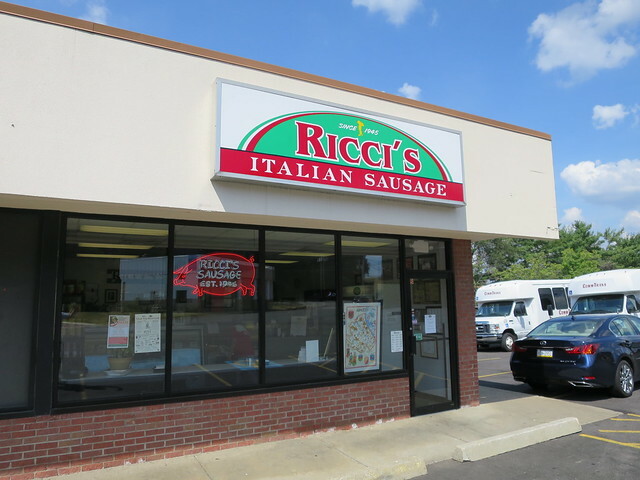 Their Sicilian sausage is the best Italian sausage I've ever had in my life. Truth. definitely enjoyed the short time in Pittsburgh, really cool city - more banana pepper sandwiches next visit for sure. 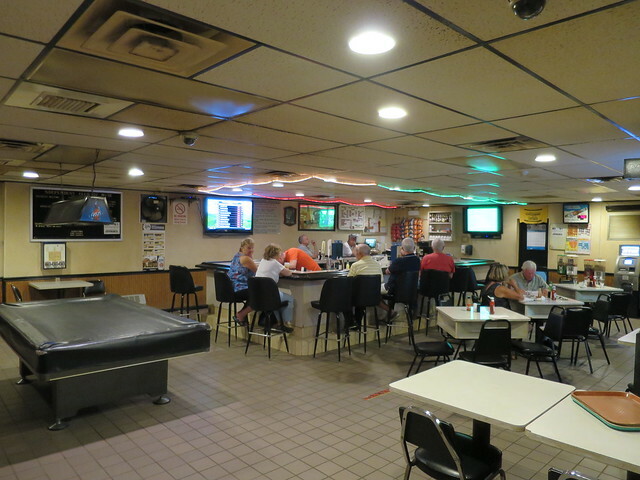 Fish fry spot at the local club was fun as hell. Yinzers seem to be good folk. enjoyed a cold beer and an Italian Sub from Triangle, decent meats, nice fresh italian dressing on the sub - Solid place. I think like most folks here I dig cevapcici(cevap for short) found a good one at Fredos Deli and my first taste of avjar(red pepper caviar) - awesome. 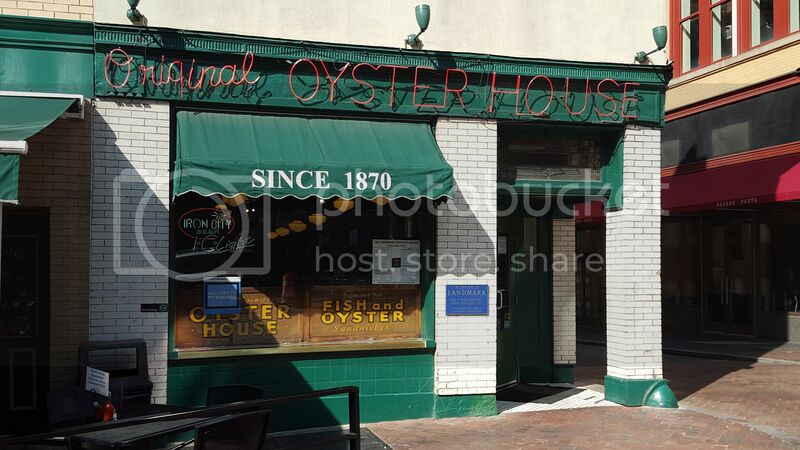 Didnt get a pic of the Baltimore House over in Pleasant Hills, PA. - Enjoyed some nicely prepared live from the coast blue crabs, as well as a couple lbs. of snow crab legs. Smokey old bar - but a good feast I thought. Primanti Bros. - I dunno - I had a couple bites of a sandwich from there - I really didnt like their slaw. Had way to many places to hit and too little time in Pittsburgh, id go back. I did a 46 hour jaunt to Pittsburgh to goof around and to test my body out. I had some major surgery last fall, and was just cleared to carry a suitcase in January, and wanted to see how my stamina was doing some sightseeing and touring without an automobile, as I'm going to Europe for 10 days at the end of April. That being said, my weight isn't where I want it to be, so I couldn't just go into a full foodathon mode. So my plan was to hit one restaurant and one microbrewery each day. I was going to hit a second microbrewery on Saturday, but the weather wasn't conducive for walking, my stamina was starting to flag, and Tessaro's is on the 87 bus line that goes downtown so two $10 Ubers for a second beer seemed wrong. So I had carrot cake instead. Wholey - Friday 1:30pm: I have photos on my phone, I'll edit the post once I get them cleaned up. I've been in Wholey before, but it was after eating at DeLuca's, so I didn't buy any food that time. The idea of going to Wholey for lunch on a Lenten Friday seemed perfect to me. I was going to walk over from my hotel (the Kimpton Monaco downtown) but the winds were gusting over 40 mph so discretion was the key and I popped for an Uber. The line was about 20 minutes long to get cooked food, but it moved steadily. One of the staff was passing out samples of smelts. I picked up a 1/2# cod sandwich, and I'm pretty sure it was closer to 10-12 oz, two really nice pieces on a Mancini roll. I also picked up a small lobster bisque, and a 65 cent piece of cornbread. Got it to go, and leisurely ate it at East End Taproom two blocks away, washed down with a Monkey Boy Hefeweizen. It was a great sandwich, and it reminded me of the old Deluxe that used to be in the UIUC campustown. 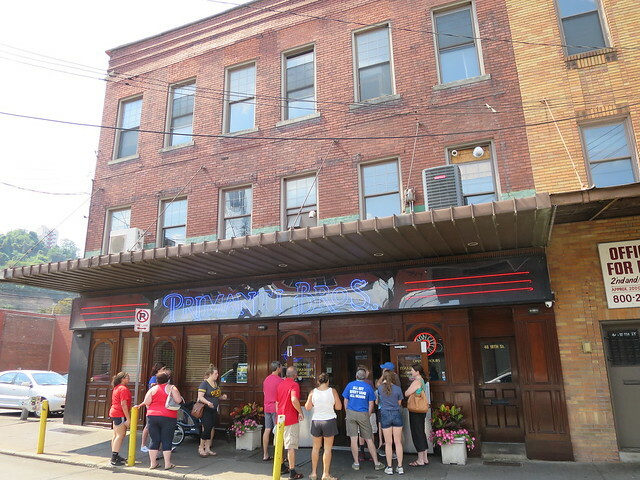 Tessaro's - Saturday 3pm: I put a longer review on the Tessaro's thread. My third time there, my third outstanding meal. One of my favorite hamburgers in America, and an excellent value. Allegheny Coffee - Strip District: Mostly roasting, but they'll make you a coffee drink while you wait. A very rich mocha, high quality chocolate. Also had a coconut "biscotti" which didn't have the texture of one but was a very good cookie. Crazy Mocha - Liberty Ave. : A full place on a Saturday afternoon, all locals except for me, lots of high school and college students. Friendly vibe, mocha was good not great, carrot cake was a soild B. East End Taproom: Not their microbrewery, but a little taproom in the Strip District. I was there around 2pm on a Friday, and there was a steady stream of mostly couples playing hooky on a Friday afternoon and wanting to take a break from shopping. Hefeweizen was a B. Grist Mill: A bit out of the way, but I'm glad I went. I got there right as they opened at 2pm on a Saturday. The weather wasn't conducive to strolling the neighborhood, but if I have a car next time, I'd like to go back. Their Kolsch was an A-, their coffee Porter a B.
Warhol Museum. Half price ($10) on Friday from 5-10pm. I wasn't an enthusiast because I'm of an age where I associate him with his late 70s work and the work right before his death, and as a teenager I wasn't much of a fan. But I was curious to learn more about him. It was an excellent museum, and I gained an appreciation of his early commercial work, and I quite liked his drawings for newspaper advertisements and the like from the 1950s and early 1960s. He was a heck of a businessman. Heinz Museum. Way more than I thought it was going to be. A very diverse set of exhibitions. My favorites were the French/British/Indian War exhibit, and the Pittsburgh Illustration Society exhibit. The only installment which fell flat was the Western PA Sports Museum, which was a big blah and I'm a sports fan. Virtually nothing on Roberto Clemente, for example. Overall, I spent more than two hours at the Heinz, and if I didn't have a schedule to keep I probably could have lingered for a full third hour. The 28x bus from the airport runs every half hour and takes you downtown for $2.75 each way exact change, or $2.50 if you pay at the machine inside the airport (and you can buy your return ticket there as well.) There are many major hotels within a three block walk of one of the downtown stops. Tessaro's is on the 87 bus from downtown. Uber and Lyft were frequently on a surge, anywhere from 1.2 to 2.2x. I had to check both programs each time, as sometimes there was a 50% difference between the two. But somebody in good shape could easily walk in good weather between the Strip district, the downtown hotels, and the Warhol and PNC Park. Unfortunately, as real as the Primanti Bros sandwich is, apparently its Origin Story is not in the least real. Sigh. I posted a link to Saveur's Primanti Bros. article over at Roadfood.com (http://forums.roadfood.com/Origins-of-the-Primanti-Bros-SandwichThe-BIG-LIE-Okay-not-so-big-and-more-of-a-fib-m870537.aspx). There was quite a response from the Pittsburgh community and its many ex-pats. 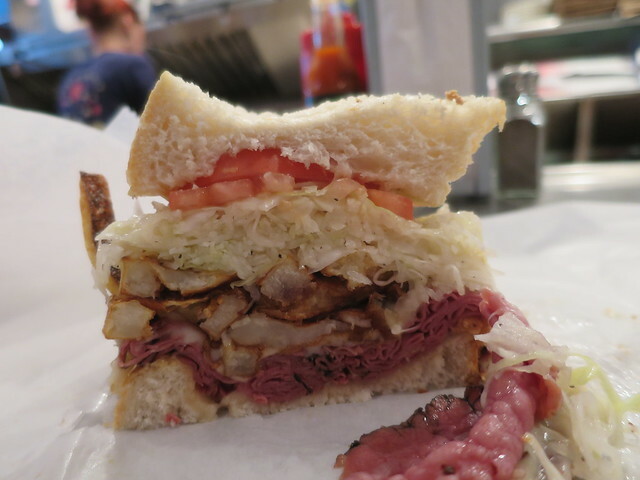 Apparently the article's author is the only one laboring under the misconception that the Primanti Bros. sandwich was created for steel mill workers. 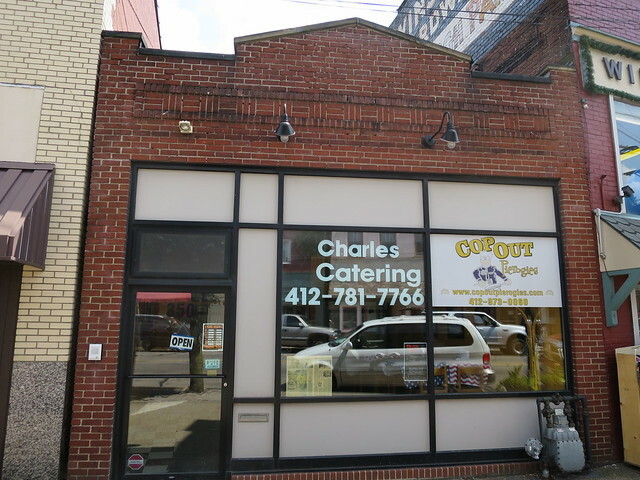 Every Roadfood respondent was well aware of its roots as a sandwich for the dock workers and truck drivers down in the strip district. They uniformly scoffed at the notion that steel workers would ever have the time to leave the mill for lunch due to a short break time and the long distance from the factories to Primanti Bros. I have no doubt you posted the link in good faith. But it seems Ms. Wist was the only one who believed the myth. Her editors at Saveur might have done well to do a little independent research before publishing her article. Sorry Buddy, my sarcasm didn't get through. Of *course* it was originally a sandwich made in the Strip, for the Strip workers and no one else. That's why the best time to eat one was after midnight, when the Primanti's store was not just the only one open, it was rocking with the workers coming off second shift in the warehouses and on the docks. Steelworkers carried lunch pails, and if they went anywhere on the South Side, it would have been Chiodo's. We need a sarcasm icon!! No need to apologize. I just wanted to make sure you hadn't been duped like I was in reading the article. Seriously though, where's the editorial oversight at Saveur? It took no effort at all to find out from angry Yinzers, this story ain't got legs. I totally agree with you--what *was* Saveur thinking?? Thanks for clarifying my OP. threadkiller wrote: I did a 46 hour jaunt to Pittsburgh to goof around and to test my body out. I had some major surgery last fall, and was just cleared to carry a suitcase in January, and wanted to see how my stamina was doing some sightseeing and touring without an automobile, as I'm going to Europe for 10 days at the end of April. I lived in Pittsburgh for a bit as a young lad in my mid-20s. I wasn't particularly athletic, but I was in overall good health. Yet after spending my entire previous life in the table-flat Midwest, it took me about a solid month just to walk around the neighborhood without getting winded. In the two years I lived there I never really did get acclimated to riding my bike around town. Geo wrote: Steelworkers carried lunch pails, and if they went anywhere on the South Side, it would have been Chiodo's.